I have an Nvidia GEForce2 MX/MX 400 graphics card with 64 MB RAM. For me this is more than enough and meets all my needs including playing a couple of OpenGL games. And I get decent frame rates with this card - provided I have installed the Nvidia's proprietary drivers for Linux. But to play the new games on the block especially the graphics intensive variety, you might need a more powerful card. And Nvidia and ATI are the two dominant players in the graphics card market. Seriously how does one choose a graphics card from the ones available in the market? If you ask me, the best bet would be to strike the right balance between price and power. But there are a couple more things you have to consider before you make the jump. James Yu lists 10 things one might consider before buying a video card. It is not something that one may not be aware of but nevertheless it makes an interesting read. Hi Ravi, your blog has been added to Linux Blog Aggregator. Your support is cordially welcome! The link says AGP is pretty much dead...But reality kicks in, and suggests AGP is still dominating the majority of desktops...So much so, that Nvidia plans to release the GF7600-series in AGP forms in the future. 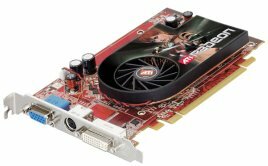 If you're an Nvidia fan, go with the GF7300GT with DDR3. (It beats a GF7600GS, GF6600GT and is just a few frames slower than the GF6800GS! )...Alternatively, go for a GF7600GT, if you need more grunt. Either way, the GF7300GT/7600GT gives pretty damn good price-to-performance.